Old Fountain oil on linen on canvas 8"x10"
The purpose of some fountains in Rio de Janeiro was to provide potable water to the city. Some of these are still working today in their original form. This one was first built in downtown area in 1883, then in 1904 as a part of the process of modernization of the city, it was transferred to the south zone in the district of Botafogo. Well, this is pretty much what I´ve been trying to do. This is the first image I see whenever I get out home, although I´ve already painted it, I´ve never composed it this way. The morning light bathes the old fountain with Corcovado Mountain in the background as a witness. 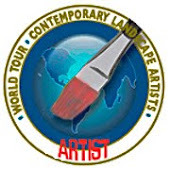 This painting is going to Far and Near Horizons - World tour of contemporary Landscape Artists. I thought it would be interesting, to send a piece of my "daily life". The exhibition is already in its second year and to start this season it will be in Eastes Park - Fine Art Gallery, Colorado USA.